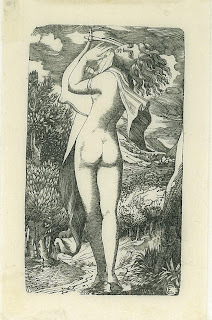 It is thought that this wood engraving The Baccante was cut from an Edward Calvert design by the artist, Welby Sherman. It is one of two engravings made after the subject. This version was released in 1904 in the Carfax Portfolio in an edition of 30 impressions .The other engraving of which there is only one impression (British Museum) was probably cut by Calvert when he was learning wood engraving, possibly under the supervision of Sherman. There is very little information written about Sherman or the part he played with the Ancients. It is thought that Palmer’s wood engraving, Harvest under a Crescent Moon was probably engraved by Sherman in 1826. It is also known that Sherman stayed at Shoreham for extended periods and was often short of money. He even swindled Palmer’s Brother out of his family inheritance of £500 in a billiard game, and fled abroad.